I feel called to stay in Bali. Despite friends and family back home that think this is a silly idea. To add to the dilemma, I know that if and when the eruption happens, everyone will be able to say to me “I told you so”. Despite this, I’m staying. For now at least. Tomorrow may be different but for today I know I’m meant to be here and support the island. Not because I HAVE to be but honoring that I feel CALLED to stay in this transformative energy. Today in yoga I received a glimpse into the ‘why’. Seriously, it feels like it would be easier if the volcano would just erupt — massively — and get it over with. We could clean up and move on. Instead many feel and experience fear in anticipation for what the eruption will bring. I find myself on edge at moments. My funniest example is when I was sitting at my dining room table working, the chair next to me started shaking. My heart was pounding in one second and immediately my mind jumped to ‘it’s a tremor and the volcano is going to blow’. We’ve had so many tremors and very recently a 5.0 earthquake. But then I quickly realized that my dog was scratching an itch and vigorously bumping the chair next to me. This edgy energy is all around as we carry our face masks and goggles, just in case. With that said, there’s a peace here that takes Bali’s magic to another level. Or it could be the calm before the storm of mass destruction. How peace and fear of destruction can exist in the same place at the same time is fascinating. The roads are empty, hotels have zero occupancy and restaurants are closing because there is no tourist traffic coming to eat. Those of us that have lived here for years, find it a little refreshing to feel like it’s the Bali we all knew and loved from the past. But the reality is that there is already great despair here and the volcano has only erupted a few puffs of steam and plumes of ash. The drivers have no one to drive, workers are having their salaries cut in half or let go. Everyone needs money. Not for niceties but for necessities. 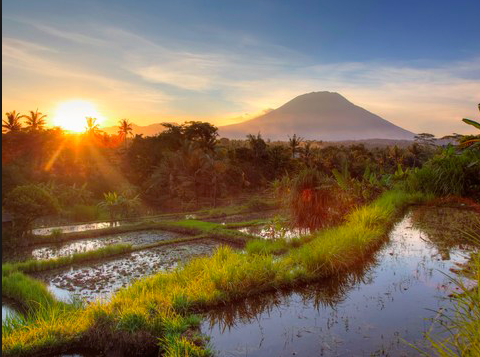 As a westerner, it’s interesting to experience along with the Balinese as they have relied on tourists (so have we) for their livelihood for so long that there is now an enormous gap in the flow of money. To amplify things, the Balinese are starting to feel the effects of westernization. They have taken out loans for cars, villas, toys, you name it, to capitalize on the booming tourism industry. Without a savings plan to back up their expenses, many people will be hosed financially. Inevitably we know that when people lose money and possessions the energy can change quickly. Irritability, desperation and eventually unrest that can lead to stealing, cheating and lying to stay alive at all cost. So this will be the biggest test of Bali culture possibly to date. This idea of unrest has crept into my mind as I further evaluated over the last few days — should I stay or should I go? Could Bali become dangerous for a single female who lives alone? Today in yoga I set the intension of connecting into the greater energetic vortex here on planet earth. What happened next I wasn’t expecting. As I went through the movements glancing out the window at the birds eye view of Mt Agung, I started to feel emotional. The tears were swelling and I was working on staying in touch with my breath, staying grounded and allowing myself to feel whatever came through. Two main messages were loud and clear. Gratitude and compassion are critical to the survival of this volcanic storm. Yes, they are always applicable but highlighted at this point in time. While these are basic concepts, sometimes the application can be more of an opportunity than we expect. Once the energy of those words resonated within me, I couldn’t hold back the tears. The feeling of ‘how can I help?’. I’m here to shine the light but I want to do more. Then an idea came to me. At Blossom Bliss Bali we have been focused on supporting the Balinese from the beginning as we manufacture in family compounds to support local villages. While being in a larger manufacturing center has many benefits to profitability, we’ve chosen to support the families in my lead silversmiths village. Why? Because they work with empowered hearts and are committed to our mission of “Pollinating the Planet with Love” by blessing each piece with love as they are hand-crafted. It only feels right to help give back in a bigger way. Not only by remaining in the local villages by providing jobs but to give a donations from our sales to organizations who are supporting the over 71,000 Balinese evacuee’s and all the others who will soon be in dire need of basic resources. Soon there will be a larger cry from the majority of Balinese who will be out of work for an unknown and possibly extended period of time. I want to help by providing funding to key non-profit organizations who continue to assist others. Since my corporate background was in women’s health, I’m passionate about helping woman. We will be donating proceeds to the Bumi Sehat Foundation who’s focus is on providing birthing and pre/post natal support to mothers and children in need. The non profit organization is lead by Robin Lim who back in 2011 won CNN’s hero of the year award for her miraculous work assisting pregnant woman and children to receive the care they need. We’ve set a goal to sell 1000 Mini Mantra Word Bar® Necklaces by Jan 31st by hitting this goal we’ll donate 15 million Rupiah to the Bumi Sehat Foundation and other non-profit organizations in need of support. The mantras on the necklace are worn close to the heart helping to manifest your desire and blossom abundance. So it’s a win-win for everyone and a way we can support the greater cause of Pollinating the Planet with Love. Beth’s innocent passion for photographing flowers led to a stunning realization that she had a gift for channeling messages through Mother Nature. This unique relationship with flowers and the guidance she received from them changed her life in ways she never could have imagined. After a 15+-year corporate career, she traded her high heels, designer suits, and luxury high-rise living for flip flops, helmet hair and the rice fields of Bali to pursue a new mission to be “Pollinating the Planet with Love.” In 2014 she opened the first retail store for Blossom B.L.I.S.S. Bali, a line of products infused with love and the blessings of Balinese artisans from villages near Ubud. The products are hand-crafted and designed to inspire people through the power of flowers, symbols and words to live a life of pure love and purpose.